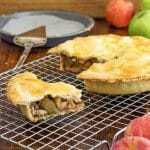 Easy homemade apple pie recipe with shortcrust pastry is as delicious as it sounds. Made from scratch including the pastry crust and simple apple pie filling. Wash, core and dice the apples. Place them in a bowl with sugar. Mix until all the pieces are coated with sugar. Divide the pastry in 2. Take one piece and roll it out thin. Transfer it in a cake/sandwich tin that has been lined with baking paper and the sides and rim greased with butter. Press the pastry down and to the sides. If your pastry doesn’t cover the sides and rim – simply take some more and fill the gaps. Pierce the bottom with a fork. Bake in a preheated oven at 180°C/356°F for 10 minutes. Meanwhile: Roll out the other piece of pastry. Make sure it is wide enough to cover the cake tin. Once the crust is pre-baked, take it out and fill it with apples mixed with sugar. Brush the rim of the pastry with egg wash. Now it’s time to cover it with raw pastry. Press down the pastry to seal the edges so the juices won’t come out. Brush it with egg wash. Finally, make a cross/star in the middle and pierce the pastry several times. Bake in the oven at 180°C/356°F for 40-45 minutes.